That first Thanksgiving celebration was about gratitude for being helped to survive in a new, bewildering country. This year, let’s do the same for some of the world’s 22.5 million refugees. 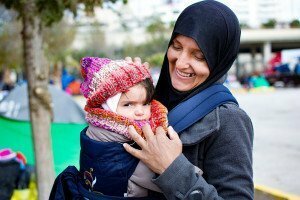 “WHEN I FIRST SAW images of refugee moms who’d walked hundreds of miles holding their babies, all I could think was how exhausted they must be,” says Glendale, CA–based Cristal Logothetis. So in 2015, Cristal requested donations of 100 baby carriers to distribute at refugee camps in Greece, and the response was so huge that she launched the nonprofit Carry the Future, which has provided more than $1.5 million worth of baby supplies and aid to displaced families abroad and at home. “Diapers are desperately needed—in most camps, parents get just one to three a week. There are lots of babies with rashes and fevers,” she says. Hold a drive and ask people to give a pack of diapers or $10. The diapers will go to resettlement organizations in the United States; the money will purchase them for camps overseas. For more info, visit carrythefuture.org. Over 30,000 grateful parents, like this mom, have received baby carriers. CAROLYN ANELLO and her husband, Frank, believe in being good neighbors, so in 2009 they sponsored a refugee family from Burma through a program in Denver. “We did things like help enroll their kids in school and show them around the supermarket,” says Carolyn, a dental hygienist. “What’s ordinary to us can be confusing to refugees—forms are in a new language, they’re dealing with a new currency.” Two years later, the couple formed Project Worthmore, a nonprofit that improves life for local refugees through mentorship and services such as a dental clinic. It has served over two thousand refugees a year—but you don’t have to act on a large scale to make a big impact, says Carolyn: “Just having a friend who is from America or has been here a long time can help someone get acclimated.” Google “resettlement agency” and your zip code to connect with a family, and give your support at projectworthmore.org. “IN 1964, during the first Syrian war, my grandma—who was pregnant—packed a suitcase, put her five kids in the car, and fled to Jordan,” recalls Luma Mufleh. “When I was growing up there, she took me to volunteer at refugee camps. Meeting kids your age who don’t have the things you do but are still so strong is humbling.” Years later, after moving to the United States and eventually settling in Georgia, Luma started a travel soccer team so refugee children could enjoy something they loved from home. She soon learned that what they really needed was help adjusting to something they weren’t so familiar with: school. “There were kids who were born in a refugee camp, then lived there up to 12 years. Some had never been in a school setting in their lives,” says Luma. 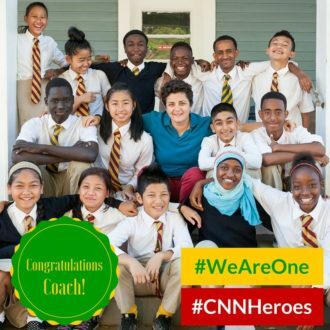 In 2007, she founded Fugees Academy, the only school in the U.S. that exclusively focuses on educating refugee children, to “create a safe place for them to heal and learn.” Sharmila, 15, did not speak English when she came from Nepal four years ago and “was placed in a school where no one talked to me,” she says. Then she transferred to Fugees. “They welcomed me and took away my fear of not being understood.” For Luma, the work has just begun: Fugees is set to open a second location next year, and she says, “I can’t lower the number of people who are displaced, but I can make it easier for some to rebuild their lives. I believe this country allows people to succeed regardless of their backgrounds. That is the American way.” Donate to this life-altering program at fugeesfamily.org. Luma (in blue shirt) with some of the students from 39 countries who have attended Fugees Academy.